We’ve made it to week four and it’s hard to believe we are already half way done! Guess time flies on the Express(o) tracks! Each session has had new discoveries, new challenges, new solutions, and lots of fun! This week our three groups made progress on their projects and also took time to check out other group’s work. The train car team used the band saw for the first time to cut plywood sides for the train car. They even attached a panel that had pre-cut shapes which made perfect windows! Next they are planning on adding wheels and a flap door so they can sell coffee out of the back of the train car. The train tracks team used a new material in an inventive way! They cut down a material called TREX which is normally used for decking, then cut it into strips for the train tracks. Now they can curve and bend the tracks for an uphill or downhill ride! Next we will have to see if the train car will move on the tracks they’ve made. Can’t wait to see if it works! The coffee/coco team tested the strength of their structure last session and realized it needed some work. This week they reinforced it and now it’s stronger than ever! They also started making the shipping boxes for the coffee and cocoa that the crane will pick up and set down into the train cars. A super interactive project!! The train track group had some engine-eous ideas for making the tracks curve by using a decking material called TREX. Bear cuts cross sections for the train tracks. 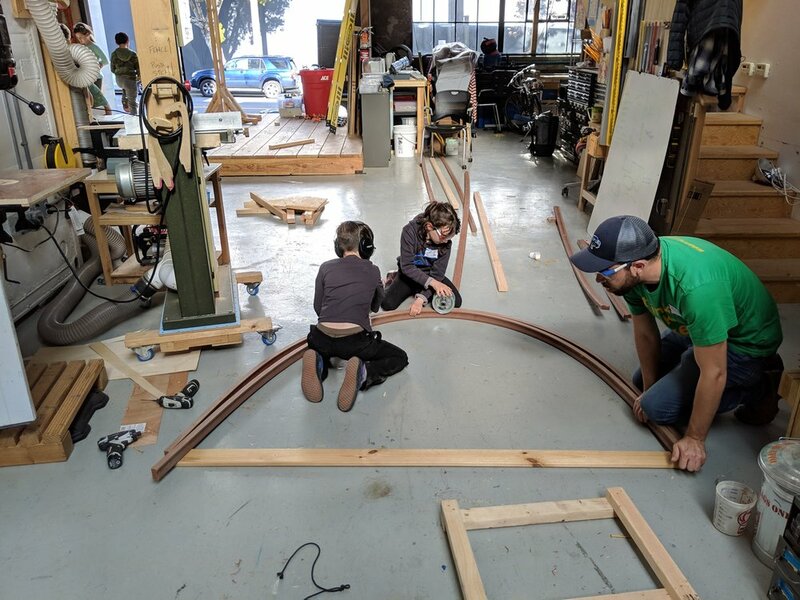 Willa connects the cross sections to the rails. Xanti, Bear, and Willa work together to make more tracks. Field trip! The groups take turns checking out each other’s projects. Jackson works hard to reinforce the crane’s main structure. Lily and Ayana put the plywood sides onto their first train car.